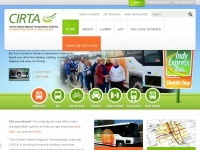 Central Indiana Regional Transportation Authority (CIRTA) exists to coordinate and define the delivery of public transit services throughout the region. 7 links pointing to Cirta.us were found. Individual words like Site, Visit, Connect and Commuter are frequently used in text links from other websites. The most important links to the website are from Tbhcreative.com and Cirtaconnects.blogspot.com. The sites /pages/home/default.aspx and /commuterconnect/calculator/ are frequently referenced by external sources. The table shows the most important links to Cirta.us. The table is sorted in descending order by importance. The table shows websites of Cirta.us, which are often linked by other websites and therefore they are classified as important content. three profiles were found for Cirta.us in social networks. Among other social networks the website is represented in Facebook, Twitter and YouTube. The web server used by Cirta.us is located in Ann Arbor, USA and is run by Merit Network. This web server runs 9 other websites, their language is mostly english. A Nginx server hosts the websites of Cirta.us. For managing the data of the webpages the CMS WordPress is used. The website uses the latest markup standard HTML 5. The website does not specify details about the inclusion of its content in search engines. For this reason the content will be included by search engines.